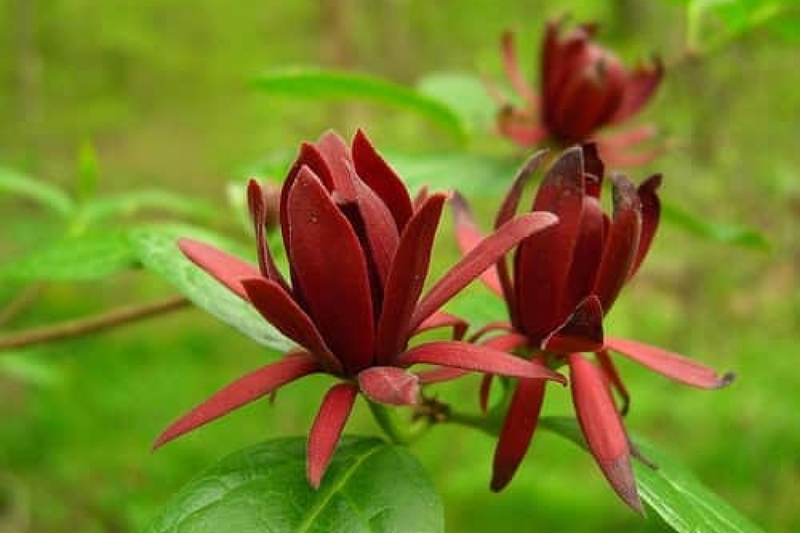 Sweetshrub (Calycanthus): growing, planting, caring. The sweetshrub - Calycanthus - is a genus of flowering plants - easy and sweet ! Calycanthus are deciduous shrubs growing 1–4 metres (3.3–13.1 ft) tall and wide. The bright green leaves are opposite. Notably, the bark has a strong camphor smell that is released when stems are scraped. The also strongly scented flowers are produced from late spring through early autumn for Calycanthus occidentalis, and early april to summer for Calycanthus floridus. Typical of the Calycanthaceae family, the flowers lack distinct sepals and petals, but instead have distinct spirals of tepals. The lotus-shaped flowers can resemble a small magnolia flower. Calycanthes are hardy and reach their adult size - 2 meters - in a few years, enjoying the sun or partial shade, in fresh soil, humiferous, possibly heavy. Plant from late autumn to early spring, in full sun, in normal or heavy soil. Make a hole twice as large as the root ball, without mixing the layers of soil - you will put them back in order while planting. Put back some of the bottom soil, and arrange your calycant at the right depth. Do not bury the base of the stems. Replace the soil and tamp well around the roots. Add some mature compost at the end of the planting. Form a hollow and water until it no longer flows visibly, then mulch around the foot. The trimming of the calycanthes is simple: cut down the whole plant above ground level every year during the winter, and that's it.